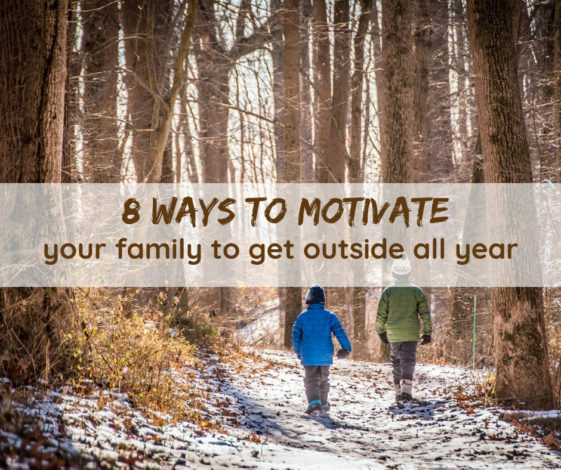 Depending on where you live, it can be difficult to get your family and friends motivated to get outside in certain seasons. For those who live in the far north, winters can be brutally cold and icy. Summers can be unbearably hot and humid for those who live in the south. 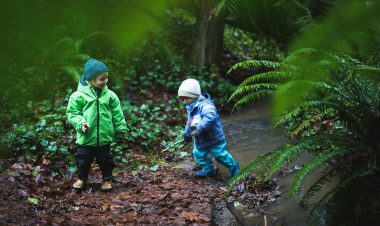 And for those of us who live in the Pacific Northwest, rainy season can kill our desire to get the kiddos suited up and out the door. So how can we keep our family, friends and ourselves motivated to get out the door regardless of the weather? Read on for some fun ideas to help take your mind off the weather conditions and focus on enjoying all that Mother Nature has to offer all year round. 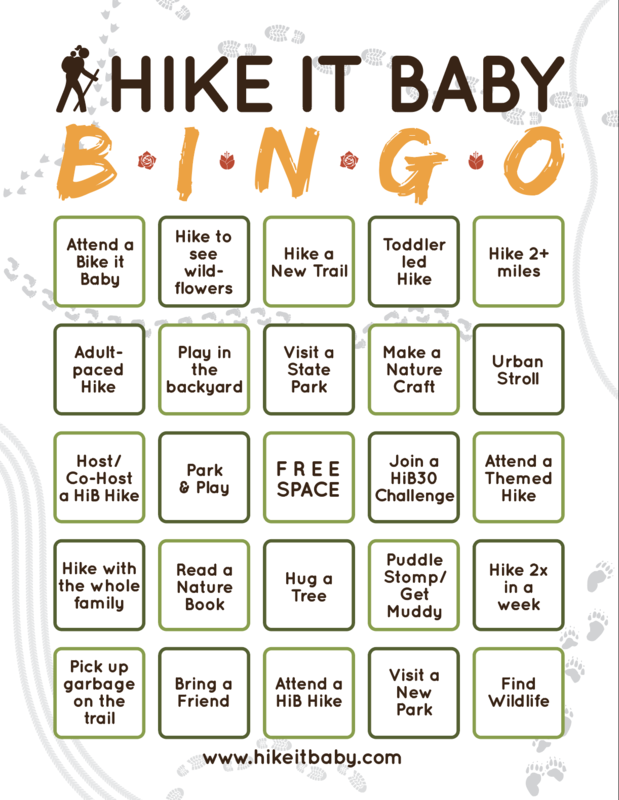 Almost since the birth of Hike it Baby, we have brought you the Hike it Baby 30 challenges to help motivate families to get outside for 30 minutes 3 times a week or hike 30 miles in 30 days. These challenges, occurring twice a year in April and September, come with a unique and gorgeous challenge sticker, an amazing and supportive community on Facebook, and the chance to win some awesome prizes! If you are not a member of Hike it Baby, now is a great time to join and gain all the perks of finding a community of like-minded families like yours! 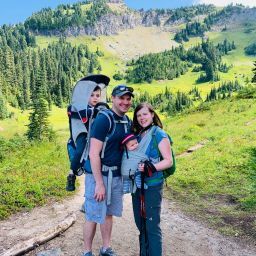 This brand new project, started by Leah McDermott of the popular blog Your Natural Learner, encourages families to commit to the goal of getting outside at least 150 hours throughout 2019. The 150 Hours Outside Project is free to join and comes with a supportive and motivating Facebook group along with weekly e-mails that provide helpful tips and encouragement to get families outside as much as possible. Having a seasonal bucket list that includes some of your favorite activities to participate in as a family can be a fun way to get the kiddos excited for the upcoming seasonal changes. Whether it is to go sledding in the winter, search for wildflowers in the spring or splash in a creek in the summer, these lists can keep us motivated to seek out nature whenever we have the chance. 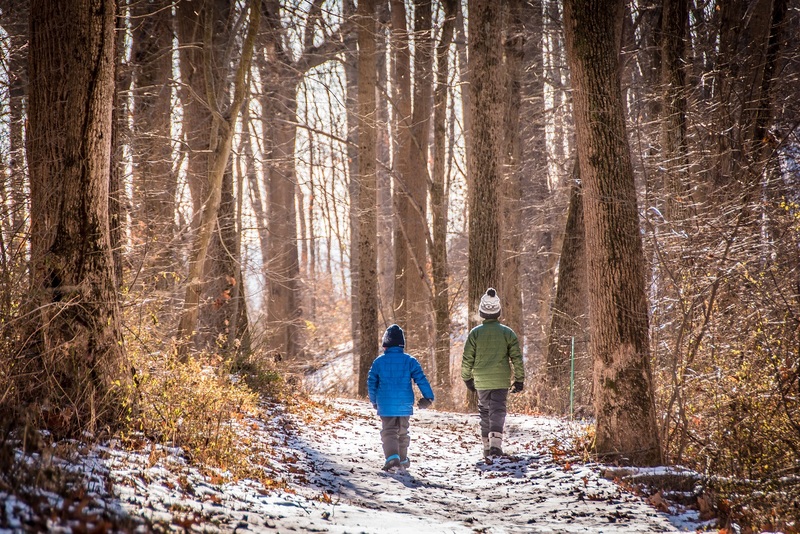 Check out this fun bucket list for winter for some ideas on how to get your family outside this winter. Scavenger hunts are one of the most versatile options for sparking the interest of kiddos (and adults) of all ages! They can be tailored to the season, the environment, the intended age group, which of the five senses you are focusing on, you name it! For example, I created a scavenger hunt tailored to garden at a nearby park. We had the kiddos look for flowers of different colors along with animals they may see in the garden and pond nearby. Here is a nature scavenger hunt that focuses on using all your senses. You can read more about exploring the senses using scavenger hunts in this article, or find tons of links and ideas for other scavenger hunt options here. Who doesn’t love a good game of Bingo?! 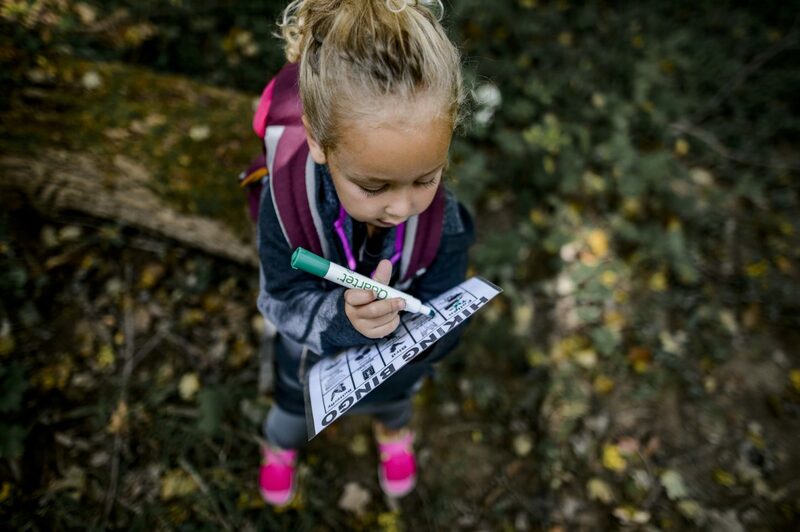 You can create a Bingo sheet with customized squares to include various outdoor-related activities from something as simple as “find evidence of wildlife” to “jump in a puddle” to grander goals such as “hike 2+ miles” or “go on a sunset hike.” Or you can use one we’ve created, and maybe even add prizes for those who reach a 5-in-a-row bingo or a “blackout” bingo! I created a Bingo card for my family with the prize of a trip to the ice cream shop as our reward every time we reached a Bingo. Similar to a bucket list, these lists include 30 fun things to do outside with your family. Looking for a list more tailored to the snowy winters of your area? 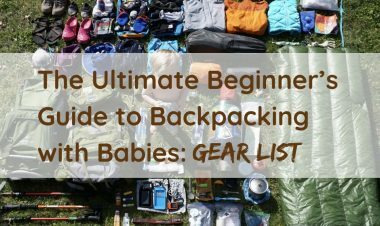 Check out this fun winter list from Hike it Baby member Melissa Kindt. Find tracks and footprints in the snow. Head out to the slopes for some skiing. Go for a flashlight walk. Have a campfire and roast marshmallows. Use water and food coloring in spray bottles to color the snow. Go for a walk and look at holiday lights. Enjoy a warm drink outside. Set up some chairs or blankets and look at the stars. Go on a winter scavenger hunt. Make a snow obstacle course. Build a mini sledding hill in your yard. Why not put your list of outdoor activities into calendar form to tackle an activity a day for a month? I took a list of fun and wacky “holidays” that could be celebrated outside (such as Kazoo Day on January 28) along with the moon phases that we can observe and activities that we always enjoy (such as splashing in puddles and finding evidence of animals on the trail) and put them all on the January calendar with one “outdoor adventure” per day. We tend to switch around our “outdoor adventure of the day” at times to make them work with our schedule, but this has helped to inspire us to get outside as much as possible! You can find a list of fun holidays and a lunar calendar for moon phases. Here’s an Adventure a Day template we’ve put together that you can download and customize for your needs. 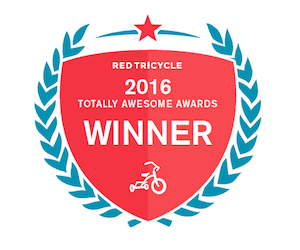 There are many organizations that put on local outdoor challenges as well. For example, there is a waterfall challenge in the Adirondack Mountains of New York where you can visit a certain number of waterfalls to earn a patch. And in San Diego, the Missional Trails Regional Park Foundation puts on a 5-Peak Challenge to encourage hikers to explore the park. You can check with your local Hike it Baby branch or nearby parks to see if there are any local challenges in your area. How do you keep your family motivated to get outside and enjoy nature all year round? Do you have any favorite challenges? Let us know in the comments below! Photos by Jessica Human and Laura Castro. Trail Tips Challenges, HiB30 Challenge, Hiking with Kids. permalink.